Today we are interviewing Nicholas Wyman, author of Job U - How to Find Wealth and Success by Developing the Skills Companies Actually Need. Tell us a bit about yourself.Nicholas Wyman is a speaker and expert on applying real-world solutions to the challenges companies face in ﬁnding skilled employees. He is CEO of the Institute for Workplace Skills and Innovation, which develops mentoring programs for corporations and places people in apprenticeship and training programs globally. He has an MBA and has studied at Harvard Business School and the Kennedy School of Government. He started his skilled career as an Apprentice chef. Millions of people are unemployed or underemployed, and at the same time, industries are struggling to find skilled people to fill well-paying jobs, to the extent that they have to send jobs overseas. This mismatch is called the Middle Skills Gap, and it’s a huge threat to the economy. I show individuals and industries how to find one another. 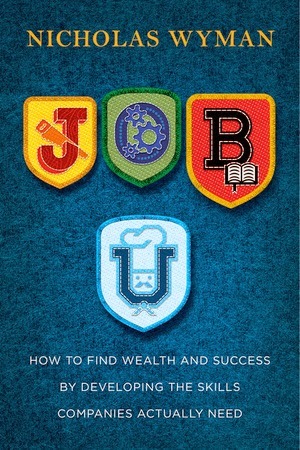 Whether you are recent high school or college graduate, or well along in your career journey, Job U is written to help people of all ages and backgrounds find a more secure and prosperous future. What inspired you to write a book about employment and education? Having seen the power of Apprenticeships myself at an early age, my company the Institute for Workplace Skills and Innovation has launched over 10,000 young people in satisfying and rewarding careers through apprenticeships. I wanted to help people ‘imagine the possibilities’ around the emerging opportunities in employment and education. When did you first notice there is room for improvement with job-seekers today? I recognize 2 key changes that are transforming the way people live and learn and the gap that has emerged some call the skills gap – I call people without jobs and jobs without people. Globalization and rapidly changing technology are impacting the way people all over the world live and they way they learn and this will dictate the skills employers need into the 21st century. Job-seekers need to understand these changes and equip themselves with the transferable skills they will need to get – and keep a job. In the book, you reference the fact that 53% of college graduates are unemployed or underemployed. During the course of your research, what did you discover to be contributing to this number? Is it going up or down? Unemployed American college gradates are not alone. The International Labor Organization in Genève recently noted there are nearly 75 million unemployed young people worldwide. Many of these people have college and university degrees, yet can’t secure meaningful work. With a rapidly changing global economy, people need to consider the options and job prospects in a particular industry before committing to an often ‘pricy’ college education – expecting a guaranteed job on graduation. This is no longer the case. Americans owe over 1 trillion dollars in student loans. That’s more than Americans owe on credit card debt! Why do you think vocational/technical education, apprenticeships, etc haven’t received the attention they deserve? There has been a myopic mindset of ‘college for everyone’ whilst other career pathways, such as vocational ‘earn while you learn’ have been seen as second best. There is often a stigma around apprenticeships and vocational careers - which Job U debunks. What was the most interesting thing you uncovered while writing this book? How astute employers are taking steps to make human capital their point of difference - their competitive advantage. These employers are opening up to whom they might employ and breaking from traditional hiring practices. Companies like IBM, Cisco, Verizon, Microsoft, Motorola, Con Edison and National Grid who are partners in the Early College STEM schools are leading the way and graduates of these schools are first in line for jobs. Simply put – I hope people who read Job U see how they to can have a satisfying and rewarding career and follow their passion. You’re fairly active on Twitter. Have you found it to be an effective medium for sharing information? Twitter is a great way to have short conversations with people, no matter where they live. It’s an opportunity for people to ask me questions and for me to get to know people and their interests. You are hosting giveaways on Twitter and Goodreads. Tell us a bit about them. For people who Preorder the book now we’ll send them the first chapter with advice and career resources and a JOB U bumper sticker. People can buy the book online and register for the offer at www.jobubook.com. Will there be a book tour in support of your book? If so, where can fans see a schedule? Tour dates, upcoming events and speaking engagements will all be listed under events on www.jobubook.com. I like to start conversations and see what people are interested in. I wrote a blog ‘Can’t Find the Right Person to Fill the Job? The Single Most Obvious Place You Might Not Have Thought to Look’ recently and was overwhelmed with 25,000 views, 200 detailed comments.